I don't have a clue what I am having yet... but I know you guys have already got plans so tell me about em!!! My potato-kale-kielbasa-leek soup was fabulous yesterday, so I want something that isn't so wet today. I'm thinking about five-spice tilapia with green onion and ginger frizzles. I'm going to cook up two chicken fried steaks, one for tonight and one for Saturday's lunch. Probably with mashed potatoes and something green. Ziti with spaghetti sauce and a side salad and garlic bread. Yesterday ended up being spaghetti because I was in "lazy" mode. Hmm...seem to be having a lot of those lately! LOL. Today will likely be clean out the fridge day as there seem to be leftovers piling up. Not really sure. We were supposed to be on our way to Mississippi at 3 this afternoon. Our flight has been delayed until 6pm because of ice storms there. It will probably be airport food. Something warm and comfy! The cold spell is supposed to hit tonight. I found some frozen chili. So I grabbed it. do come.... Don't think I'll have time to go to the store and buy new stuff for dinner. I've got 2 grilled chicken breasts in the fridge, leftover from the other night. Hubby was thinking he wanted to make a big ol' grilled chicken salad so he will have to make a trip to the grocery for lettuce. I have cheese, tomatoes, onions, and salsa. Maybe some avocado would be nice in it too. We will perhaps have tortilla chips with that or maybe a grilled cheese quesadilla on the side. I'm not too crazy about main-dish salads when its cold outside but he's a real rabbit - likes his greens every day. Its just in the low 40s and still some snow on the ground. Brrr. 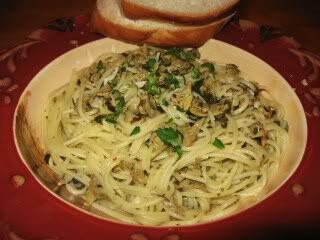 I think it will be pasta/white clam sauce, green salad and a freshly baked baguette to sop up all that yummy sauce!